ARRIVAL. As we watched last week's events cut through the ice floe of our national conversation about class and race — about disparity in general — and as they opened a hideous, yawning chasm further dividing us, churning up in their wake misunderstanding, hatred and fear, I felt deeply and unexpectedly despondent. Anxiety, frustration and ignorance seem to have been given full voice, with racism and sexism finding their empowerment as a toxic, convenient corollary. Our inability to find common ground, and the systemic cultivation of that continued inability, have brought us precariously close to what feel to me like the shores of crisis. Bleak, even for me, I know; one might even go so far as to say totally inappropriate for a movie column. Attempts will be made to turn things in a more salient direction. My native tendency, in the face of such things, runs toward self-medication. My habits, monumentally distressing events notwithstanding, are not as wholesome or healthy as they could/should be, but I realize this. So in the face of such events, I am self-aware enough to realize that inoculating against sadness with stupor, while effective in the short-run, is a dangerous and ultimately unsustainable method. Better altogether to seek out loved ones, small life-affirming pleasures and art that celebrates and elevates those aspects of humanity that could possibly save us from ourselves. Arrival became the antidote to my distressed and diminished world-view. Not a panacea (even I am not convinced that art can take the place of proper discourse and social action) but a shot in the arm to remind me that people are not necessarily inherently venal. A sign that there is the possibility of communicating and growing and changing for the better. There are dark days ahead, I am sure, but there remains reason for hope. And, no surprise, director Denis Villeneuve was the one to deliver that message. I've held up Villeneuve as the great hope of contemporary cinema for years now. His American feature debut Prisoners (2013) created tension unlike any I've ever experienced in a movie theater. Enemy (2013), his attendant psychological-thriller/head-trip, posed profound questions about identity and anonymity, even while feeling like a fun little side project. And Sicario (2015), suffused with dread and defined by absence, by negative space, transcends classification. And that's really the thing about Villeneuve: He works within genres (possibly why his movies have not received more awards consideration) but his perspective is so unique, his vision so clear, his technique so impeccable that he only enlarges and improves those genres. 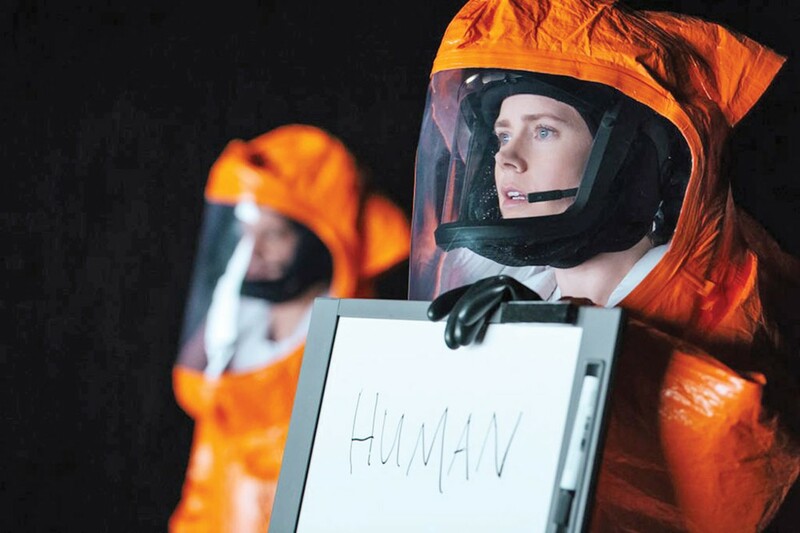 Which he does again with Arrival, both a perfect science-fiction movie about aliens landing on Earth and a treatise on love, communication and the imperative struggle for understanding. We are introduced to Dr. Louise Banks (Amy Adams) as a woman devastated by the death of her daughter, so enveloped in grief that the arrival of alien craft around the globe at first barely registers. Because she is perhaps the world's foremost linguist, though, it isn't long before Dr. Banks is approached by military intelligence. Col. Weber (Forest Whitaker) enlists her aid, after some initial resistance, to attempt to establish communication with whatever life forms may inhabit the shell-like obelisk (called "the Shell") hovering above Montana. She will lead one team while Dr. Ian Donnelly (Jeremy Renner), a renowned astrophysicist, leads the other. All this under the watchful eye of the U.S. Army and the CIA, represented by Agent Halpern (Michael Stuhlbarg). Every 18 hours, Banks and Donnelly, accompanied by a military unit, enter the Shell and try to parse the language and intentions of the travelers inside. Intention is their prime directive, per Weber and Halpern, because 11 other Shells sit above other nations around the world, with teams from each working toward some understanding. National security and the prospect of global war hang in the balance. Eric Heisserer's screenplay, from a short story by Ted Chiang, is meticulously plotted and the progress of its narrative is sublimely satisfying. I hesitate to spool out more of it here. Thematically, it comes down to fear and isolationism versus love and openness and I'll leave it at that. Like all of Villeneuve's movies, Arrival does not have in it a single frame out of place, nor a sour note in the score or a misconceived moment of performance. It is beautiful: exquisitely crafted and acted, suffused with sadness and hope and joy in equal measure. It brought me to the verge of tears in the opening minutes and kept me there, gladly, throughout. PG13. 116m. BROADWAY, MILL CREEK. ALMOST CHRISTMAS. I'm a sucker for Christmas movies — always have been. And after the relief of Arrival, I figured why not enjoy a simple pleasure, a couple more hours of escape? Almost Christmas provided exactly that. At their first Christmas after the death of their matriarch, the Meyers family gathers at the family home in Birmingham to hopefully set aside their differences. Walter (Danny Glover) is rudderless without the love of his life. Son Christian (Romany Malco) is focused primarily on his run for Congress. Daughter Cheryl (Kimberly Elise) feuds with her sister Rachel (Gabrielle Union), who struggles to raise a daughter alone and put herself through law school. Baby brother Evan (Jessie T. Usher), a college football star recovering from injury, numbs his grief with pain pills and puts forth a brave face. Almost Christmas won't blow anybody's mind or break any new cinematic ground. But it is heart felt, warm and human, and often quite funny, particularly as presided over by foul-mouthed, tippling, larger-than-life Aunt May (Mo'Nique). PG13. 112m. BROADWAY. BLEED FOR THIS. Miles Teller plays a boxer who struggles to get back in the ring after a traumatic car crash in this true-life story. With Aaron Eckhart and Katey Sagal. R. 116m. BROADWAY, MILL CREEK. A CHRISTMAS STORY (1983). The holiday classic about the perils of pop guns, frozen flagpoles and snowsuits. PG. 94m. BROADWAY. THE EDGE OF SEVENTEEN. Hailee Steinfeld stars as an awkward young girl who's even more lost when her brother starts dating her best friend. With Woody Harrelson. R. 104m. BROADWAY, MILL CREEK. FANTASTIC BEASTS. A wizard (Eddie Redmayne) visiting New York City loses track of his magical menagerie in this Harry Potter prequel. With Katherine Waterston and Alison Sudol. PG13. 133m. BROADWAY, FORTUNA, MILL CREEK, MINOR. IDIOCRACY (2006). Too soon? An average man (Luke Wilson) wakes from a centuries-long sleep to a devolved society of dunces in which he is a relative genius. With Maya Rudolph. R. 84m. MINOR. KAMPAI! FOR THE LOVE OF SAKE. Documentary about rice wine, its makers and its enthusiasts. NR. 95m. MINIPLEX. MOONLIGHT. Mahershala Ali, Ashton Sanders and Trevante Rhodes star in a film that follows a young black boy moving through childhood, teenage years and adulthood, figuring out his sexuality, relationships and place in the world. PG13. 111m. BROADWAY. PETER AND THE FARM. Documentary about a hermit farmer in Vermont. NR. 91m. MINIPLEX. DOCTOR STRANGE. Benedict Cumberbatch and Tilda Swinton star in a Marvel movie bogged down by pseudo-philosophy and lifted up by strange and wonderful special effects wizardry. PG13. 120m. BROADWAY, FORTUNA, MILL CREEK, MINOR. GIMME DANGER. Jim Jarmusch documentary about punk band The Stooges. R. 108m. MINIPLEX. HACKSAW RIDGE. Mel Gibson's movie about conscientious objector, medic and Medal of Honor recipient Desmond Doss (Andrew Garfield) is an impressive feat, but drowns the hero's complexities in the din and gore of battle. R. 131m. BROADWAY, MILL CREEK. THE LOVE WITCH. Arcata-filmed retro comedy-horror with a witch looking for love in all the wrong potions. PG13. 120m. MINOR. MAN CALLED OVE. A joyless curmudgeon is dragged back into life by the new family next door. PG13. 116m. MINOR. MISS HOKUSAI. Animated drama about the famed 19th century Japanese artist's daughter. PG13. 93m. MINIPLEX. MISS PEREGRINE'S HOME FOR PECULIAR CHILDREN. Eva Green stars as headmistress in Tim Burton's adaptation of the book about children with magical powers. PG13. 127m. BROADWAY. SHUT IN. Naomi Watts stars as a child psychologist trapped in a New England snowstorm and trying to save a young boy. PG13. 91m. BROADWAY, MILL CREEK. TROLLS. The fluffy-haired toys of yesteryear return in retail-friendly colors and CG animation, singing and saving their village from troll-eating baddies. With Anna Kendrick and Justin Timberlake. R. 83m. BROADWAY, FORTUNA, MILL CREEK.